Tri-Art Finest Quality Professional Liquid Acrylics provide the artist with a self leveling, fluid paint ideal for high detail, glazing and watercolour-like techniques, without sacrificing colour strength or permanence. This 83 colour line contains only the highest quality colour pigments which have been selected for purity and lightfastness. 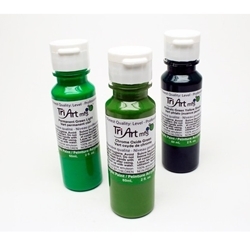 All Tri-Art acrylics are manufactured with 100% pure acrylic emulsion. New colours, with drastically improved performanence, have been chosen to mimic the rich, transparent hues of older lake pigments.